While the New Year is a great time to get healthy, anytime is the perfect time to start living a healthy lifestyle, and shed those unwanted pounds. Documenting the health and wellness industry’s most respected health and fitness research, The Party Girl Diet offers a truly delicious and fun way of life wherein you can enjoy *red wine, *dark chocolate, and a wide variety of yummy foods without the deprivation and restrictions typical of fad diets. In the above Hawaii News Now Sunrise TV segment featuring The Party Girl Diet, viewers discover the importance of eating foods that provide probiotics and prebiotics, which in addition to enhancing digestive health, encourages a flat belly since positive side effects of consuming probiotics and prebiotics include less tummy bloat and other digestive woes. Signature foods on The Party Girl Diet such as dark chocolate and red wine, and and foods that have been fermented such as sauerkraut, pickles, etc., to name a few. Prebiotics are foods that “stimulate growth and/or activity of bacteria in the digestive system.” Another way to look at prebiotics is that they feed or fortify the good bacteria in your gut. Foods in this category include rolled oats, beans, raw garlic, raw and cooked onions, raw Jerusalem Artichokes, etc. Sea salt and fresh cracked black pepper to taste. 1. Mix together all of the ingredients above in a medium bowl. 2. Serve PGD’s Flat Belly Salsa at room temperature with julienned fresh, colorful peppers, baked chips, etc. It also makes a great topping for salads, pasta, and pizza. (You can also make PGD’s salsa ahead of time and chill before serving). Please note, the offer in the Hawaii News Now Sunrise video above for a free Kindle Edition of the Party Girl Diet has expired. 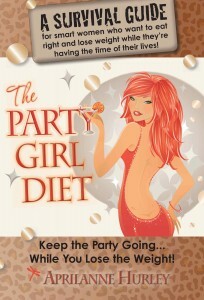 The The Party Girl Diet Kindle is currently available free with book purchase as part of the Kindle Matchbook Program on Amazon.com.